Browse Our Products - Robot Greasing Systems - Industrial Robot Supply, Inc. In today’s production environment, manufacturing lines run continuously –often times 24/7 with little time set aside for PM. The cost of scheduled and/or unscheduled down time on even a single robot pushes many facilities to neglect or skip servicing at regular intervals. This causes premature equipment failures, emergency repairs, high part replacement costs, and can shut down production lines. In addition, when the service intervals are done, the time it actually takes using traditional methods adds up exponentially with multiple robots in a line. Many spot welding and handling robots have large grease cavities on every axis, and it can take two experienced service personnel 6-8 hours to complete a grease change –per robot. Add to that the risk of damage by over-pressurizing the grease cavities using non-intelligent systems and it’s becomes a big expensive problem on production lines. 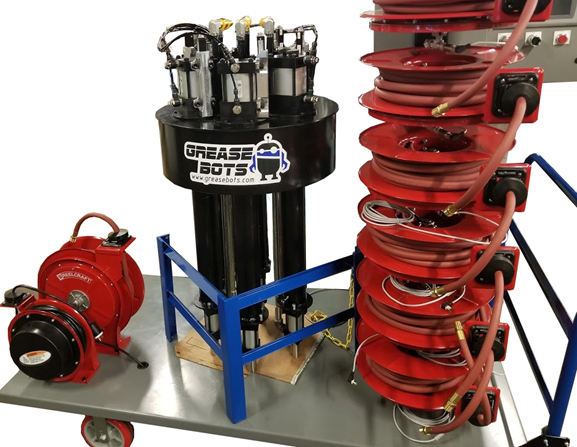 Our Patent-Pending GreaseBot greasing systems allow service personnel to simultaneously grease a robot in under 1 hour –every axis, including hookup, greasing, and cleanup. Our greasing systems are intelligent. We utilize industry standard PLC and HMI controls and specially engineered sensors and pumping mechanisms integrated into a portable platform for local servicing of each robot. Our systems are designed, manufactured and assembled at our facility in Western PA utilizing state-of-the-art CNC, waterjet, plasma, and robotic equipment in the process. We have pumping systems from dual axis that draw from 5-gallon pales up to 6-axis systems that draw from 55 gallon drums for large line servicing along with optional air-vacsystem for bulk removal. Our range of systems covers facilities from single to thousands of robots. Pressure monitoring system - grease cavities are never over pressurized. Seals never get blown. Grease never gets into the motors. Accurate volume - we monitor volume per stroke of each pump. We know how much grease needs to be dispensed and how much grease has been dispensed. We also know drum or bucket grease levels at all times. Adjustments on the fly - need to tweak grease levels or the recipe? No problem, quick adjustment on the HMI and it's saved for future use. Quick disconnects - every robot axis is connected via quick couplings. Get connected, greased, and disconnected - fast. Convenient ergonomic carts - standard. Push manually or pull with tug trucks. Extremely fast ROI - the amount of money saved in labor, and unforeseen savings due to issues caused by improper or lack of maintenance is staggering. Contact us today for a demonstration of our system!